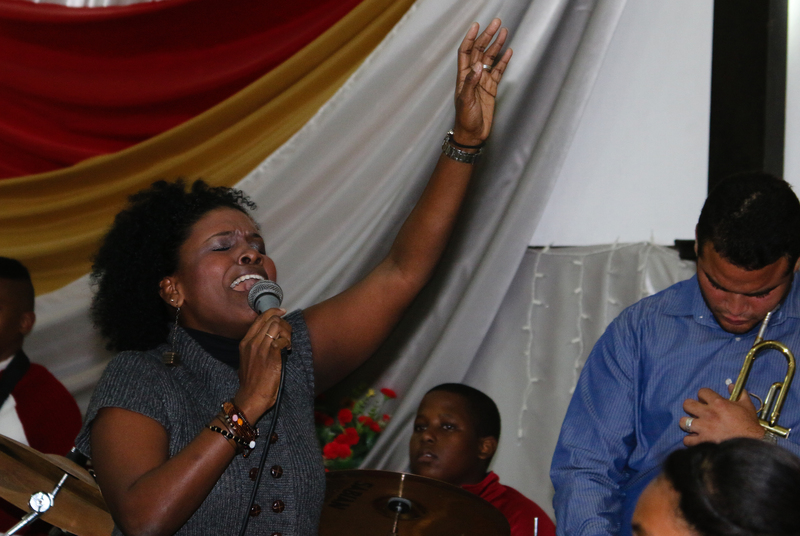 Worship leader Lauren Smith Perez singing at Central Methodist Church in Havana, Cuba. Photo by Steve Beard. Within a Caribbean culture marked by Cold War skullduggery, economic scarcity, and vindictive secularism, the Methodist Church in Cuba stands out as a beacon of spiritual freedom, miraculous signs and wonders, unexpected blessings, and salsa infused worship. Not only has vibrant Christianity survived some of the darkest decades of Cuba’s history, it is a thriving testimony to the profound hope found at the roots of the faith. “Young people in Latin America have spent a long time learning a language that is different than the language of God,” said the Rev. Guillermo Leon Mighthy, illustrating the prevailing way of thinking in Cuba. Leon is the 41-year-old lead pastor of the Central Havana Methodist Church in one of the grittiest neighborhoods in the Cuban capital. As a former professional soccer player and past leader of Methodist youth in Cuba, Leon has a spiritual counterattack for each of these phrases. “First, the Bible never says that we don’t know. We know who we are, we know what we have, and we know the One who is with us. Second, yes there is; in God there is hope. In God there is healing. In God there is blessing,” said Leon, who is also the district superintendent of Havana. Hope and anticipation are common themes in Leon’s preaching, along with spiritual warfare, victory, overcoming, healing, and blessing. These are also the repeated themes in the Cuban Methodist pulpits and the narrative of testimonies delivered during services. The spiritual dynamic behind the growth of Cuban Methodism is the “movement of the Holy Spirit,” said Pastor Aylen Font Marrero, a 29-year-old staff member of the Methodist Cathedral of Holguín, 450 miles east of Havana. 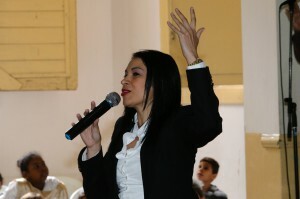 Pastor Adria Nuñez Ortiz delivering a message at Central Havana Methodist Church. Photo by Steve Beard. approximately 46,500 members, there are about twice that number involved in the ministry of the denomination in different ways. Although the personalities and styles of each congregation may differ, Font believes that Cuban Methodists are unified in “seeking God, the movement of the Holy Spirit, the falling of the fire and anticipating the glory of God to descend.” The primary focus of each congregation is “the love of God for the people of God. This is what we want to really see and experience and see grow,” she said. The embers of this revival fire have been stoked since the 1970s, reports the Rev. Dr. Rini Hernandez, district superintendent in the Florida Annual Conference. Desperate times called for desperate measures. Methodists all over Cuba were participating in all night prayer vigils, reports Hernandez. The outgrowth of their prayers were miraculous signs and wonders, including speaking in tongues, physical healing, deliverance from spiritual oppression, and being physically overwhelmed by the power and presence of God in their meetings. In an interview with Bishop Ricardo Pereira in conjunction with my first visit to Cuba more than 16 years ago, he told of his special experience with the Holy Spirit on October 18, 1984, many years before he became bishop. “At that time I had two young men in my church —14 and 16 years old. They had read about John Wesley and his ‘heart-warming’ experience,” Pereira said. The Rev. 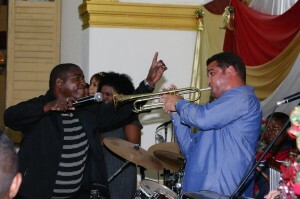 Guillermo Leon Mighthy holds the microphone for trumpet player Jorge Lázaro Corrales Estradas. Photo by Steve Beard. Although both share in an experiential and supernaturalist faith, Pentecostal denominations such as the Assemblies of God believe that speaking in tongues is the “initial evidence” of receiving the baptism of the Holy Spirit. That is not a doctrinal distinctive for Methodists. Nevertheless, Methodist services in Cuba are unapologetically charismatic. The framework for theology and ministry within Cuban Methodism was not imported from other denominations, but is an organic expression of their own unique divine encounter. The Cuban experience mirrors the religious trend of its neighbors. In the latest study of 18 Latin American and Caribbean countries and one U.S. territory (Puerto Rico), Pew Research found that two-thirds of Protestants (65 percent) identified as Pentecostal Christians either through denominational affiliation or personal self-identity. Sociologists pair Pentecostals and charismatics into the category of “renewalists” when studying international religious trends. As the fastest growing spiritual movement, renewalists account for one-fourth of all global Christians with upwards of 500 million adherents. According to the World Christian Database of the Center for the Study of Global Christianity, Brazil has the highest number of renewalists, followed by the United States, China, Nigeria, India, and the Philippines. At the outset of the Cuban revolution, the late Fidel Castro used to define the boundaries of cultural engagement to the intellectuals and artists: “Inside the revolution, everything. Against the revolution, nothing.” Within revival, the Methodist Church has transfixed and transformed – redeemed, perhaps – that kind of singular focus to a pinpoint: Cuba for Christ. 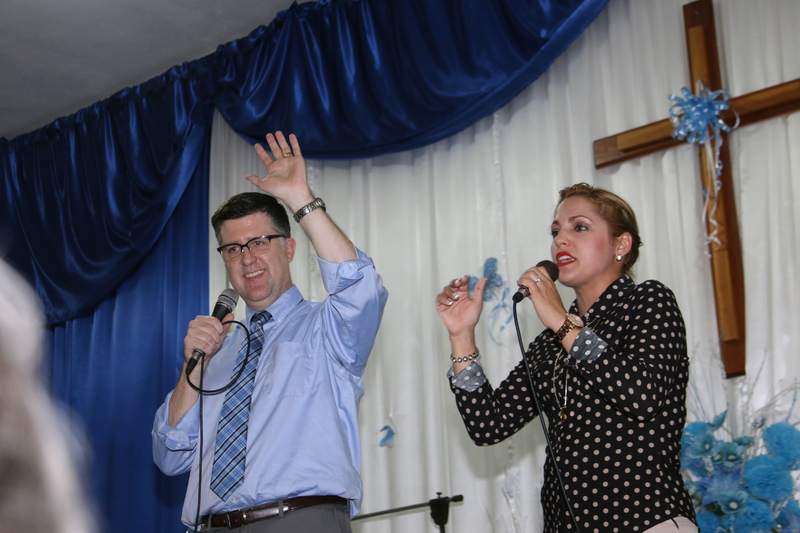 Even non-church going observers would recognize something combustible and dynamic taking place in a Cuban worship service. This is not the place to be if one has been lulled into expecting a predictable 55-minute morning service with two Victorian-era hymns, a children’s sermonette, a choral anthem, a homily, and tidy benediction. “We worship God with so much passion,” said Pastor Adria Nuñez Ortiz, “we give him praise with all we have in our hearts. We have so much love for God because we understand that he has done so much for us. Everything we do for him is nothing in comparison to what he has done for us.” Nuñez is associate pastor of Central Havana Methodist Church and married to Pastor Leon. She is also a songwriter, musician, and leader of their high-energy choir. The worship time is unmistakably Caribbean. 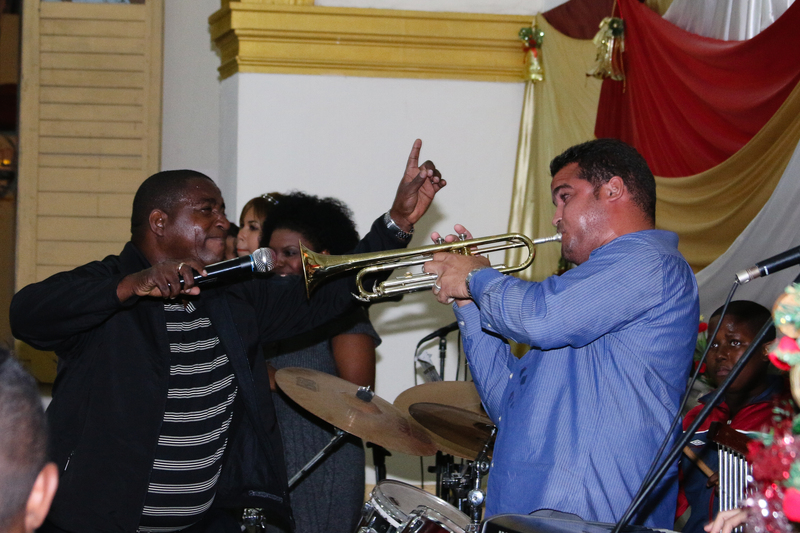 “As in biblical times, Cuban Methodists praise the name of the Lord and dance with all kinds of instruments and shouts of joy,” Bishop Pereira told me not long ago. There is a jacked-up salsa beat with a sliver of hip-hop and drums, congas, guitars, bass, trumpets, and trombones. If you solely associate Cuban music with Buena Vista Social Club, there is a brand new galaxy of sound in the church. The worship is frenetic, physical, ecstatic, electrifying, and emotional. Needless to say, many things have changed in Cuba since my first visit in 2000. Netflix is streaming (for those with credit cards); the online home rental business Airbnb is now available to foreigners, the black market emporiums are hiding in plain sight, and the Rolling Stones played last year before 500,000 in Havana in a free concert a few days after President Barack Obama’s controversial visit. With the average Cuban making less than $20 a month, there still isn’t expendable income for luxuries such as high-dollar rock concert tickets. Cell phones are omnipresent (a vibrant black market), but the internet is spotty and frustratingly slow. Private enterprises are still in infancy stages, as one might expect in one of the last remaining Communist countries. There is, understandably, a strand of “forbidden island” allure for Americans to explore Cuba as more avenues open for tourism. Many visitors simply hit the Ernest Hemingway hot spots, buy cigars, rum, and a Che Guevara t-shirt, cruise around in a 1952 pink Cadillac convertible taxi cab, and then drink mojitos on the pristine beaches. Dr. David Watson of United Theological Seminary preaches in Santiago de Las Vegas Methodist Church as Pastor Aylen Font Marrero translates the message. Photo by Steve Beard. For Professor David Watson, however, the experience is all about plunging his students into the eye of a revivalistic tornado. “A lot of our seminary students have never experienced what spiritual renewal looks like, and when they come here they get to be a part of a very powerful Spirit-filled revival,” said Watson, the academic dean at United Theological Seminary. Watson has brought students to Cuba from the Dayton, Ohio, seminary for the last three years. Amanda Moseng is one of those seminary students, soon-to-be a provisional elder in the West Ohio Annual Conference. Her trip to Cuba was sparked by a divine healing she experienced at a Holy Spirit conference hosted by United Seminary. While in Cuba, Moseng tirelessly prayed for healing and blessing for those who came forward at the end of each of the services. Not raised as a charismatic, the Cuban scenario was new, but she adapted with deftness and enthusiasm. For the last 28 years, the Rev. Jaime Nolla has made a yearly pilgrimage to Cuba. “When you see people who either walk for miles, travel on the back of a platform truck, or travel in an overloaded, very old bus, standing because of the lack of space, to get to a crowded church anticipating to experience the presence of God, your heart is moved in ways you cannot describe with words,” said Nolla, a retired United Methodist pastor and former district superintendent in the Wisconsin Annual Conference. Nolla was one of the clergypersons standing in the front of the 500 men and women jammed into the sanctuary of the Vedado Methodist Church in downtown Havana waiting to be anointed with oil. The bustling and energetic congregation worships in a striking art deco church with loud praise music spilling out from the open doors and windows near the University of Havana. The expectancy and desire was palpable as those in seemingly never ending lines waited patiently in an attitude of prayer for this blessing. Nolla’s numerous visits over such a lengthy period of time have afforded him opportunities to see innumerable Methodist congregations across the length of the island (more than 700 miles long). “When you live in a place where there is extreme poverty, the response of the people is to find wealth in other ways,” observed the Rev. Rebekah Clapp, one of my travel mates and translators in Havana. “For Cubans, that spiritual wealth has become a response to that.” Clapp earned her M.Div. at United Theological Seminary after living in Nicaragua, and is currently working on her Ph.D. in intercultural studies at Asbury Theological Seminary. It may also go a long way in explaining how the Methodist Church has been a sustained oasis in the spiritual desert of Cuba’s soul for the last 50 years. 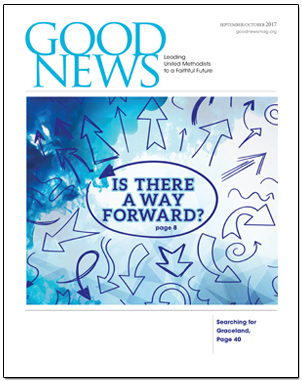 Marking his 25th year, Steve Beard is the editor of Good News. God bless His church in Cuba! However, like in everything work led by humans, I’ve been able to witness numerous negative tendencies. During many of my missionary trips, I’ve been in touch with extremely authorative leaders and I have witnessed harsh internal fights over the funds and resources fron the US. Also, you can see high levels of discrimination and intolerance within the church. Again, I pray for God’s blessings, but I also pray for discernment & guidance for its leaders. As a personal determination, I have stopped to give money to the leaders and I have started to help people directly individually. I’m heading back to Cuba soon to share with my brothers and sisters. I had the exact same experience on my mission trip a year ago to Havana Cuba. I am glad that you can go back. I will not be led around again by those leaders in Havana. I pray for the leaders to be humble servants of God. They can be better.